Why just use one mask when you can create a beautiful collage of treatments on your skin? Today’s latest craze in skincare is something called multi-masking. The idea is simply this: most people have more than one skin issue or condition occurring simultaneously. For example, you may have incredibly dry skin on your cheeks but a very oily t-zone area. Shockingly, this very same issue can also be reflected on different areas of the body. Below are different ways to use our masks for different skin issues related to the body, these can be used either for home care or in a treatment room so get your mask brush in hand! Our hands and arms are a large part of what we do, and unfortunately can be very mistreated on a daily basis causing dry skin, sun damage and ultimately premature aging. These areas are almost impossible to hide and are some of the most prominent features when it comes to visible signs of aging. 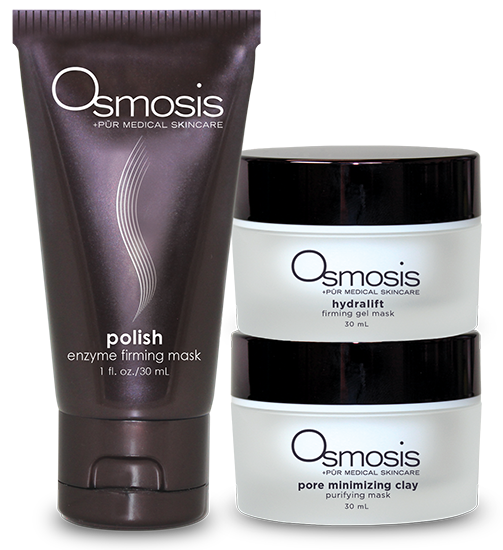 Osmosis masks to the rescue! Try the gently hydrating and firming Hydralift Firming Gel Mask which promotes cooling, healing, plumping and firming and immediate hydration. This is the perfect anti-aging treatment for the hands and arms. Need even more moisture? Mix in a bit of Immerse, a beautiful compilation of oils to help soothe very dry skin and promote wound healing. Our feet serve so many purposes, they take us where we need to go, they ground us and can even be beautiful by themselves. Sadly they also carry quite a bit of weight, that is, all of our weight on a daily basis. So how can we smooth, calm and hydrate the rough skin of our feet? With our deliciously chocolate scented Repair Mask! With a combination of healing, calming and repair promoting ingredients this mask will calm down those tootsies and help them to look their best. Are your joints reminiscent of sand paper? Knees and elbows can be particularly dry in the fall and winter months which can sometimes create discomfort. Begin with the Polish Enzyme Firming Mask to gently lift off any dead skin cell, smooth the skin and lightly hydrate the area. This heavenly smelling cranberry mask also provides antioxidant and peptide firming benefits. Upon removal, apply the Tropical Mango Mask to these areas for extreme hydration and barrier repair. Much like the face, the décolleté and shoulders can also be subject to more sun exposure than the rest of the body. The Orange Zest Revitalizing Mask has skin firming, collagen stimulating and nourishing properties but will also brighten the skin with its high vitamin C content. The Soothing Gel Mask is another great tool for this area, with brightening ingredients like lemon peel extract this mask will assist in hydrating, treating and brightening sun damaged shoulders. Although we see it the least the back can also be a hot bed for skin issues and back facials have become increasingly popular due to a rise in back acne. Our Pore Minimizing Clay Purifying Mask is a wonderful treatment mask. It is a non-drying clay mask with ingredients like bentonite and kaolin to help clear up acne and argan oil which is a sebum regulator. Have you gotten your multi-mask on? We’d love to see the photos! Please tag us on facebook or on Instagram .